Day 4 – Andy’s birthday! A special day, because it was Andy’s 25th birthday. For once we actually slept in past 8! We woke up and had breakfast in bed (the beauty of being in an Air BnB) before heading out for birthday activities. We stopped in for a cheeky burger at McDonalds (we had to have Maccas at some point AND the chicken burger was delicious) before making our way to the Maricar store in Akihabara (about a 7-minute walk from the station). 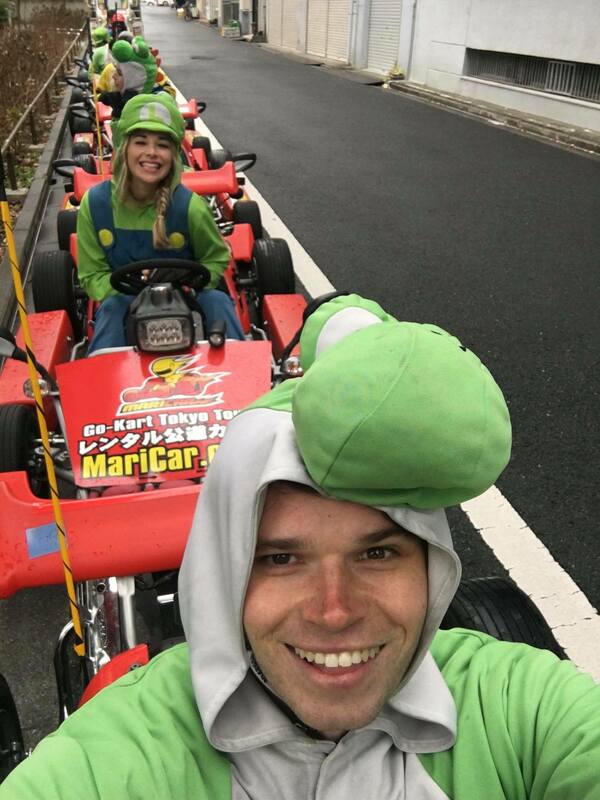 Birthday activity number one: Ripping around the streets of Tokyo dressed as characters from Nintendo’s Mario Kart game was absolutely unreal. Goodness knows how it is even legal, but it was hands down one of our highlights of Japan. We opted for the medium length tour, which in both our opinions was long enough (we spent about 2 hours in the karts) as it gets pretty cold out there. There is a bunch of different courses and times available, including at night, but I opted for the 1pm because I thought it would be a cool way to see some of the city (whereas night, although it would be epic, would be mostly bright lights). One piece of advice would be to sit in the karts immediately behind the tour guide. Our guide took so many photos of us, and because Andy and I were right behind him (I actually sat close to the guide because I was nervous to be at the back and get separated from the group, so the photos were an unexpected bonus) the pictures of us from the day were absolutely epic! 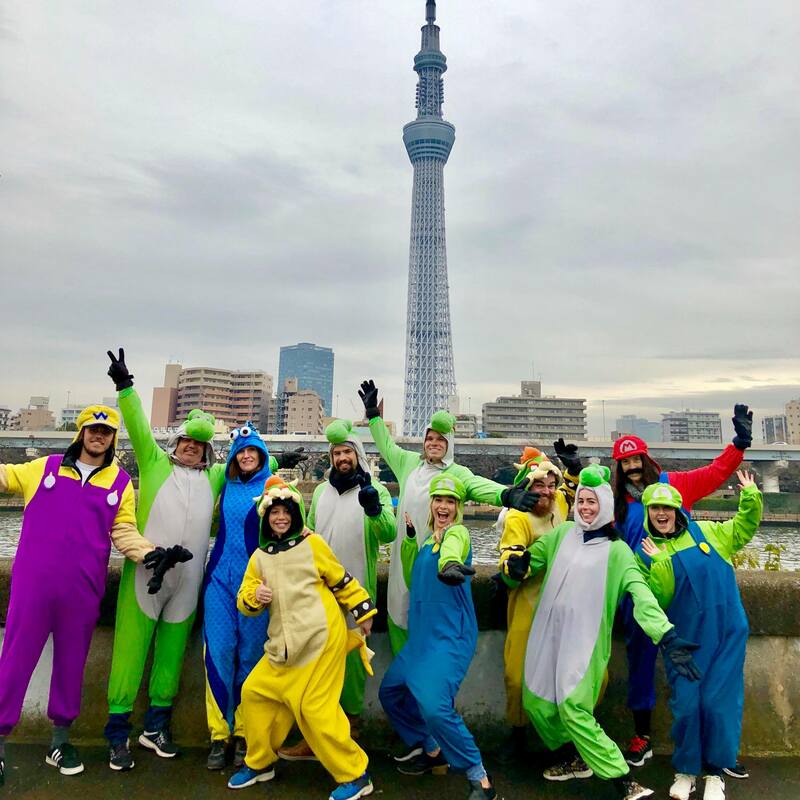 Once we were finished with the karting, the weather had closed in a bit so we spent the next few hours nibbling on donuts and sipping on coffee, while the electric streets of Akihabara absolutely came to life. Stepping back out onto the street was like stepping into a neon light shop during an explosion, it was just so loud and colourful down every street. We went into a few of the shops – they were mostly selling phones, computers, cameras and other electronics. The whole experience certainly made us feel alive! 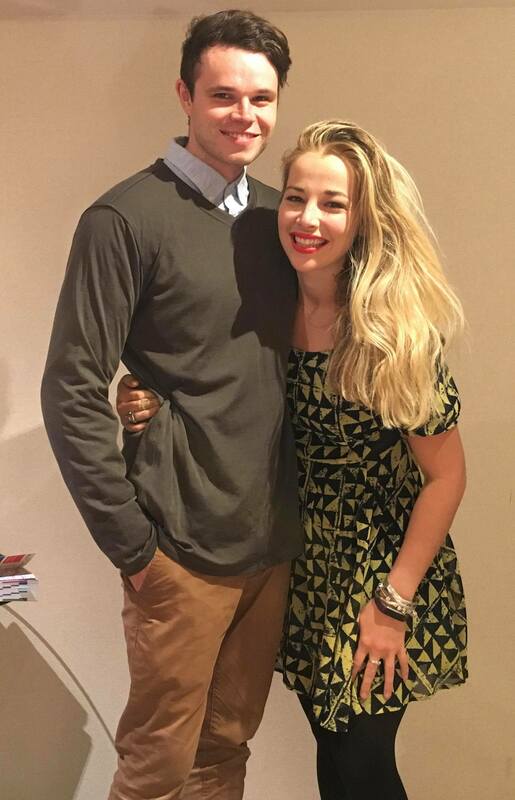 Once the cold finally broke us (well, me) we headed back to the apartment to spruce up for a birthday dinner. We ate at Girandole, on the 42nd floor of the Park Hyatt Building. It was absolutely stunning. We were seated alongside Tokyo’s skyline, with beautiful views over the city’s lights. The food was sensational; we did the bistro degustation menu which cost ¥7500 each (excluding tax) for five courses. The staff were so polite, friendly and accommodating. 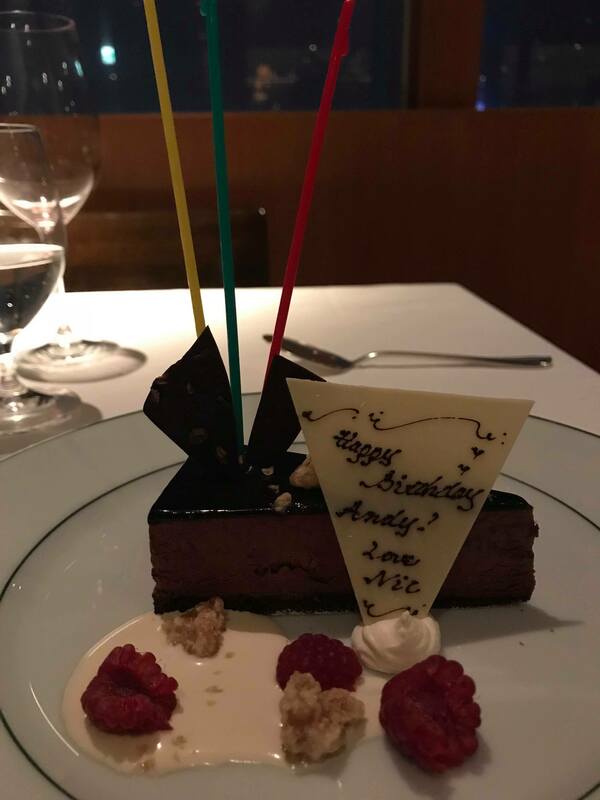 The chef even wrote Andy a birthday message on his dessert. A wonderful (posh) experience and such a cool thing for us to have done somewhere like Tokyo (I assure you, we don’t get to high roll like that too often). 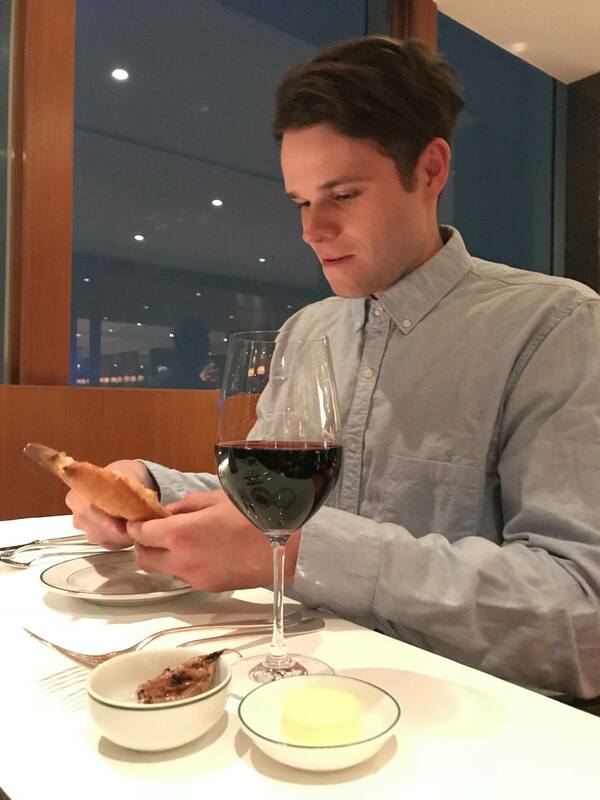 Happy birthday Andy!